Streets of our Town: All hail the Community Cup! Sunday, early afternoon. Merri station. The streets of my town, Northcote. People say we have more songwriters and musos per capita than any other place in the world. It’s a town of freelancers, huddled together, hoping we can last a few more months doing what we’re driven to do. I’m probably standing with a few of them now. I haven’t seen the Merri platform so chockers for ages. It’s chilly. 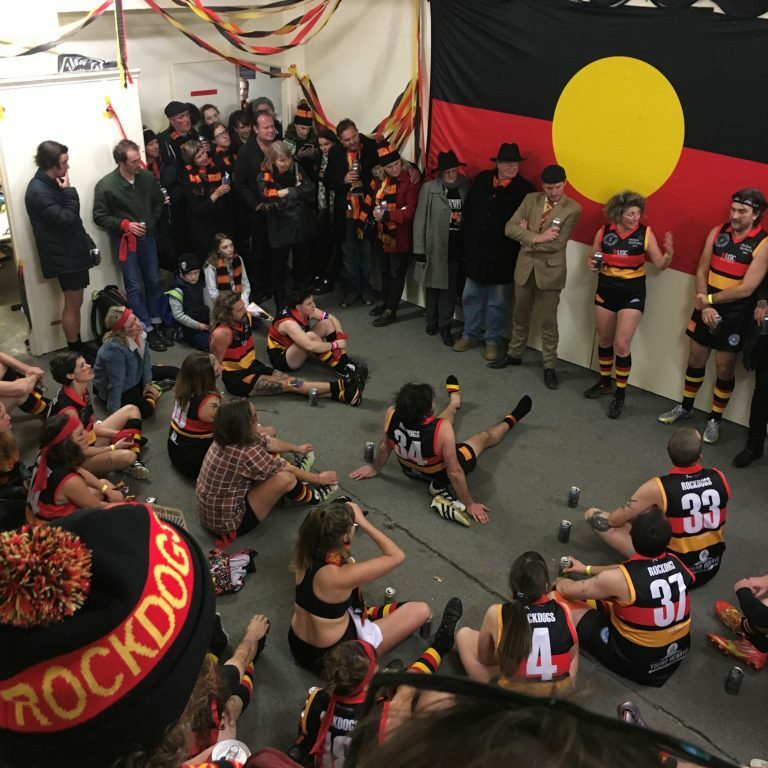 The scarves of four football teams are on show: Richmond and Carlton; the red, yellow and black of The Rockdogs and the red and white of The Megahertz. It is, after all, Melbourne. The AFL crowd is off to the clash between the two rivals at the MCG. The rest of us are off to the Community Cup. Safe to say, they are contrasting social institutions. Which overlap. As I stand here I notice the big platform ad has been changed. I have Joffa’s huge bonce behind me – he is the poster boy of the Salvos at the moment. He’s a good choice. Joffa has a go, as his book suggests. The AFL needs no introduction. We breathe its air. The Community Cup may need to be explained. 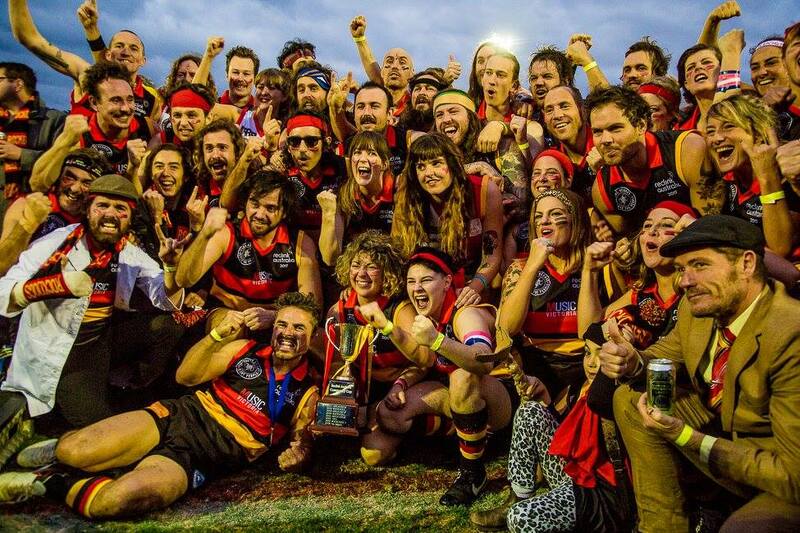 Now in its twenty-first year, it’s the annual match between The Megahertz – broadcasters from 3RRR and PBS – and The Rockdogs, made up of musos and other artistes. It is staged to make a few dollars for Reclink which is a superb organisation full of passionate people committed to making sport, and especially team sport, a force for good. 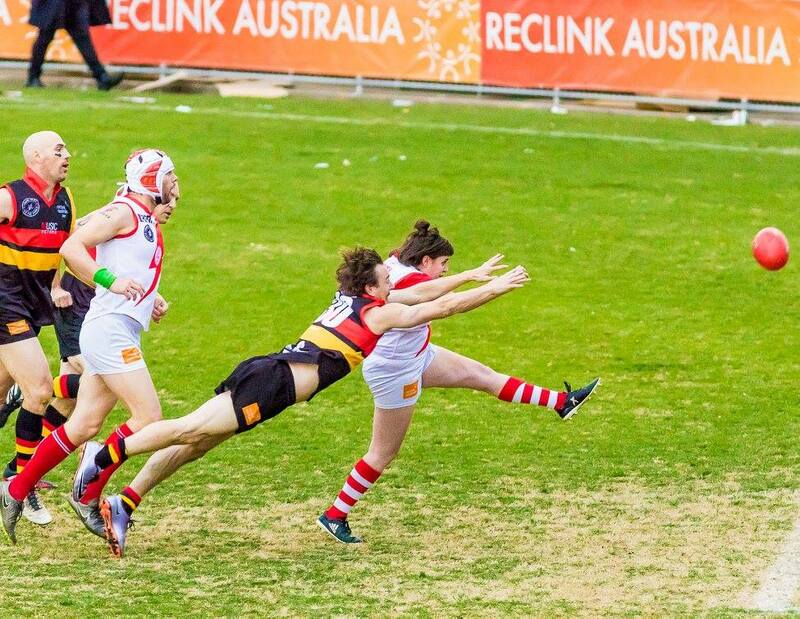 Having started in Melbourne, Reclink now organises teams and leagues in various sports – across Australia, so that people whose life circumstance has left them on the fringes, can participate in sport. The concept of play is so important. Inclusion and belonging are so important. Reclink is important. So, as I get off the train at Victoria Park, the home of Collingwood, I am walking down the ramp and across Lulie Street to the gates, with people who have this understanding. That life’s path is not always easy or clear; that fickle fortune can be a prick; and that, as much as people might congratulate themselves for their own happy circumstances, who really knows what might happen. Ask a Syrian refugee. The queues to enter are long. I feel I am with people who have come to express their support for an idea, a way, a belief. Expressed in a football match. And to watch that football match. And to have fun. I feel I am with the generous of spirit. I love that it is at Vic Park this year. I first came here as a kid in 1971 when the colourful crowd of Fagins and Nancys and Artful Dodgers milling around the entrance made me feel like I was on the set of Oliver. (It’s unlikely anyone will break into ‘Consider Yourself’ today.) The other Community Cup venues have worked too, but I am immersed in the history here; I can feel the shedding of cares and miseries as people clicked through the turnstiles and onto the terraces – their terraces – for generations. It’s so Collingwood. So 1930. I believe Eddie has a Vegemite jar of Vic Park air which he uses as a paperweight on his desk at the Westpac Centre. This sense of Carringbush struggle suits the world of music and the world of community broadcasting – with their freedom and their commitment to the essence of what they do. Music for music’s sake. Commercial success is a bonus. People who somehow hang in there in pursuit of their art. Because it is at the heart of who they are, and because it brings such joy to others. People who broadcast not for the pay cheque, but because they want to do it their way. And there are those who have enjoyed some commercial success as well. Struggle suits football too. Sometimes you’re running free, enjoying the space of the wing. Hair trailing. Taking a bounce. Running like you’ve stolen something. The World is yours. Sometimes you’re at the bottom of the pack with the full weight of the opposing ruckman transferred to your throat through his knobbly knee. Sometimes the ball bounces away from you every time you are near it. I make my way onto the ground where the majority of the crowd are congregated. Many are around the stage listening to Jen Cloher, others are kicking the footy. There are dogs everywhere. Kids everywhere. People catching up. The Rockdogs Cheer Squad – there are some stories in there – are warming up. They are a theatrical combination of earnest and ironic, raunch and eye-shadow. It’s like Flashdance on a couple of Vodka and Orange Gatorades. Jon von Goes strides towards the middle where various officials (Reclink Community Cup style officials) are gathering. JVG, who was skipper the year I was fortunate enough to play, is decked out in the flairs and broad lapels those West Indian fans donned at the 1975 World Cup Final at Lord’s. Overcoat and hair trailing. He’s the MC. And on top of his game. The bundle of whirlwind energy that is Jason ‘Evo’ Evans, who has done so much for Reclink and its sister organisations over the years, is high on life. The music stops and the crowd heads to the stands and the terraces, grabs a beer and a bite and prepare for the first bounce. It’s chockers. About 10,000 people and more outside. 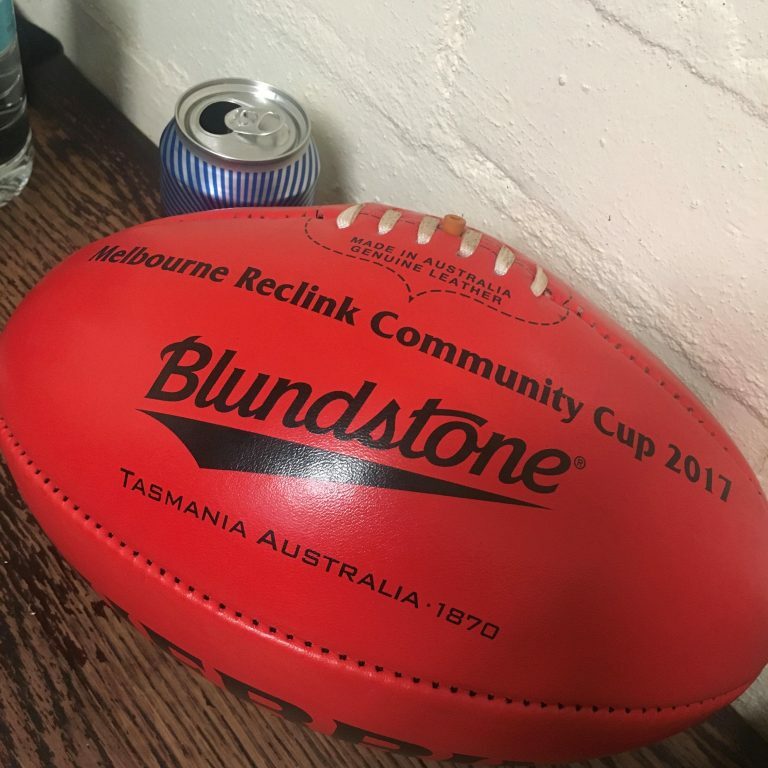 Greg Findlay from Blundstone, who are sponsors of Reclink and the Community Cup, tosses the coin. Where I am on the Turner Street terrace, many eyes are on the cheer squads who have boundless energy and have taken freestyle gymnastics to a new level. Until Deborah Conway and Willy Zygier and their daughters She Said Zed do a version of the Go-Betweens ‘Streets of our Town’ which makes me feel very Queensland in these Melbourne surrounds. 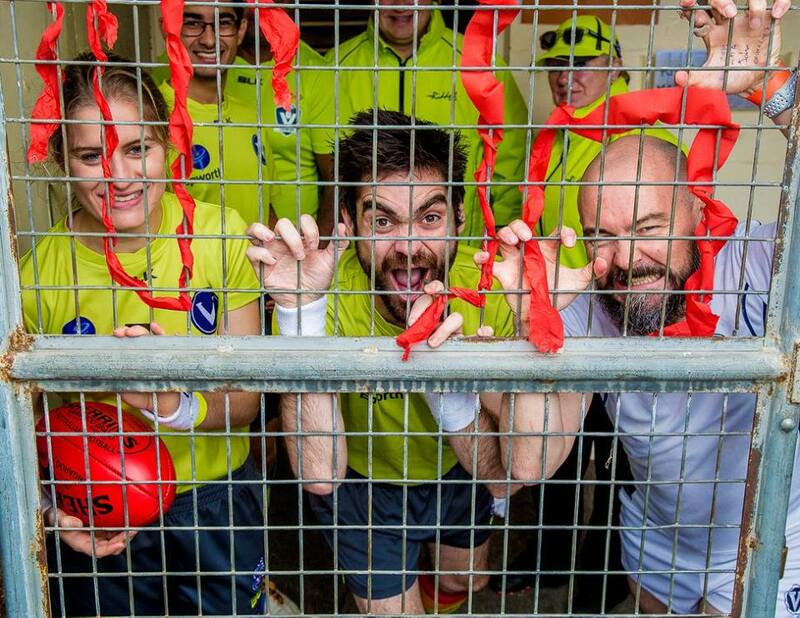 Mick James, former program manager at 3RRR, is one of the umpires. He sets us on our way. As a past player, (2005?) my sympathies are with The Megaz. I actually met Tim Rogers when he sat on my head to take a screamer. 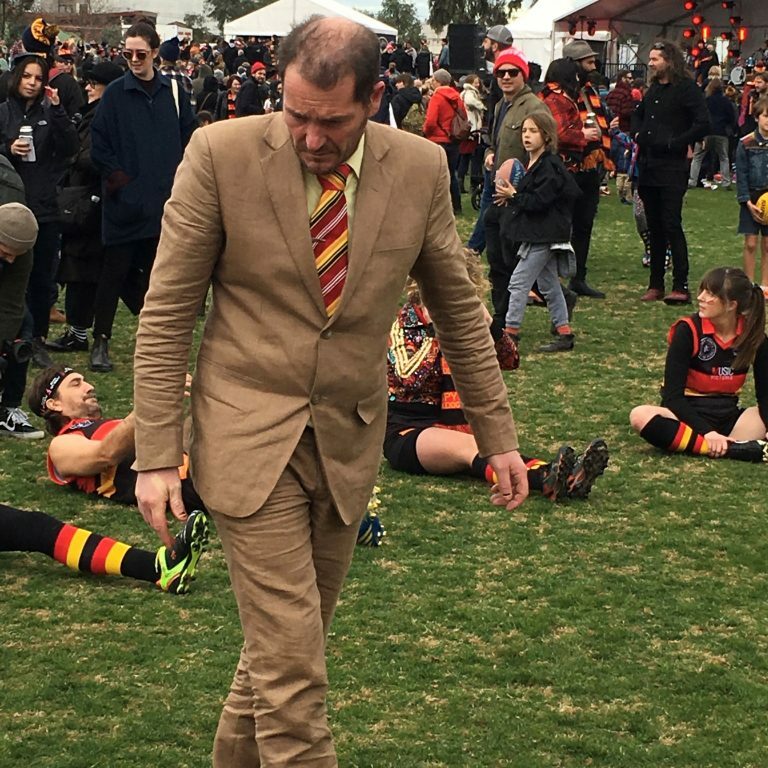 We were old mates by the time he’d taken his third and the first quarter hadn’t even finished. Tim Harrington was one of our coaches that day and still is today – his seventeenth Community Cup. It’s pretty good footy. The Megaz start well. Chris Gill plays a classic centre half forward’s role, 1970s style. With his booming left boot – and his penchant for torps, one of which falls into the lap of Adam Branson – Chris controls the game. Temporarily. But it’s on. There’s physical pressure. Kulja Colston makes some fierce tackles. For The Rockdogs, Mill O’Sullivan from Porpoise Spit is like a fox terrier and Liam Linley, tall and lean and athletic, gets The Dogs first. 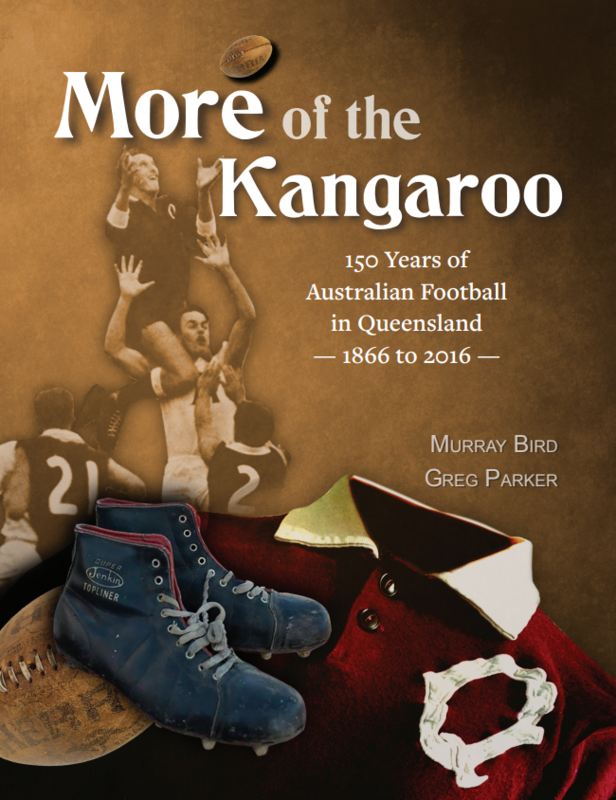 He runs straight towards the Sherrin Stand, aeroplane arms out – like a a Millwall striker. Or a rock star. 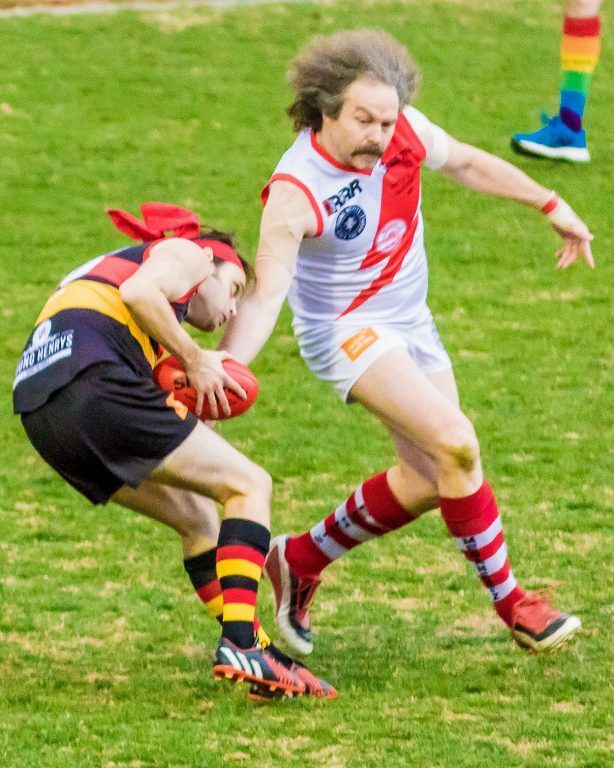 Singer song-writer Benny Walker looks like he’s played, taking a couple of grabs and striking the footy sweetly with his right. Dylan Bird from 3RRR’s Grapevine also impresses. And Sarah Hawksworth gets stuck into it too. At half-time Remi gathers the throng to his bosom as the beers continue to go down. And more beers. And the conversation takes over – despite the quality of the football and the streaking in the third quarter. The streaker count gets to three and then four, then up to six. One cartwheels memorably. The Rockdogs appear to be on top but a glance at the scoreboard suggests that there’s a kick in it and it’s anyone’s game. The angled rays of the deep-Winter sun make for a gorgeous sight of haloed footballers. Photographers reach for their kit. There’s a front and square crumbing goal in the shadows of the Sherrin Stand that would make Eddie Betts proud – to The Megaz (who was that?). But The Rockdogs fight back and have the last three shots at goal to be ahead when the siren sounds. They celebrate. And embrace. The Cup is presented. Rohan Connolly, who has the dexterity to exist in the day to day of the mainstream and the alternative, presents the medal named for his late brother Steve. It’s always an emotional moment. It goes to Ross Elliot. I stand with Reclink inspiration Peter Cullen who started it all through the Sacred Heart Mission in St Kilda and now through Reclink which he has worked tirelessly to sustain. The Megaz’ rooms are more reflective. I chat with skipper Chris Gill who presents Get Down on 3RRR. He’s a little disappointed but he’s had another great Community Cup. He’ll go back to his record shop in Fitzroy and continue to do what he loves to do. He was their first manager. The rest is history. I love stories. 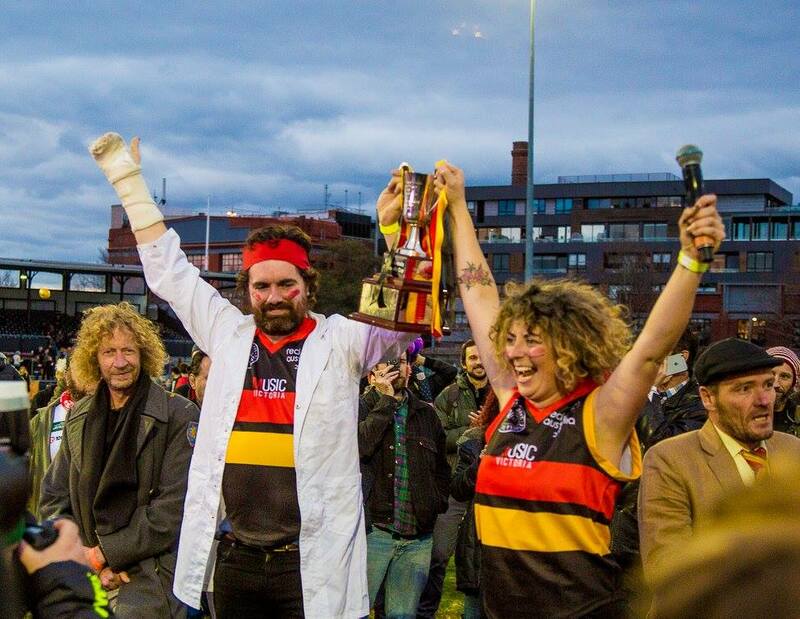 The Community Cup is one of the great stories for so many reasons. But this one has been specifically themed “Streets of My Town”. My town, my village, my suburb might be local. The ideas which the magnificent Community Cup encapsulates, and projects, are universal. The Community Cup will be in a location near you soon. Here’s the dates for the National Tour 2017. CLICK HERE. John Harms is a Melbourne writer who is originally from Queensland. He loved his time at 3RRR on Run Like You Stole Something and with Breakfasters Squaredy, Tinsel Tony Wilson and Sam Pang where he had a few pretty loose segments – Twentieth Century Bingo, Harmsy’s Highway, Help me Harmsy, and Biography Boggle. 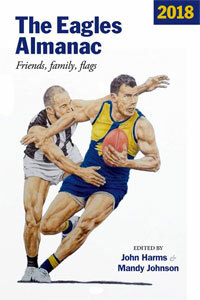 He met Peter Cullen (another Geelong supporter) on ABC774’s Conversation Hour and subsequently wrote for the Reclink fund-raising book Olympic Spirit. 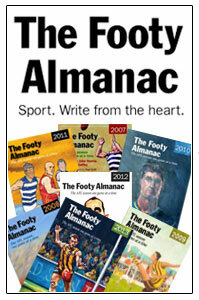 He established this website www.footyalmanac.com as a platform for story-telling, especially about sport. 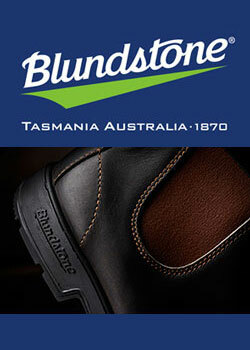 The Almanac concept is supported by Blundstone, who also believe in story-telling. 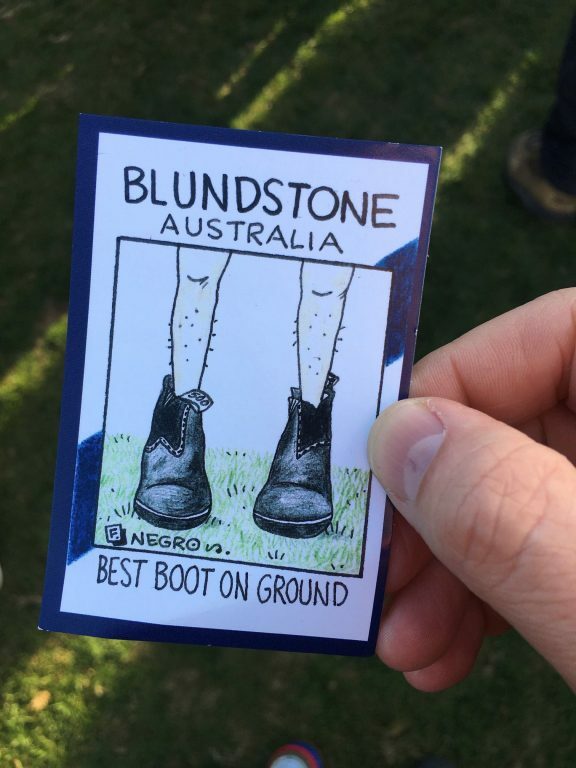 Blundstone is also a major sponsor of Reclink and the Community Cup. They have seriously good form. For a montage of fantastic Community Cup photos click here. The photos which follow are courtesy of Greg Findlay and Jason Evans. 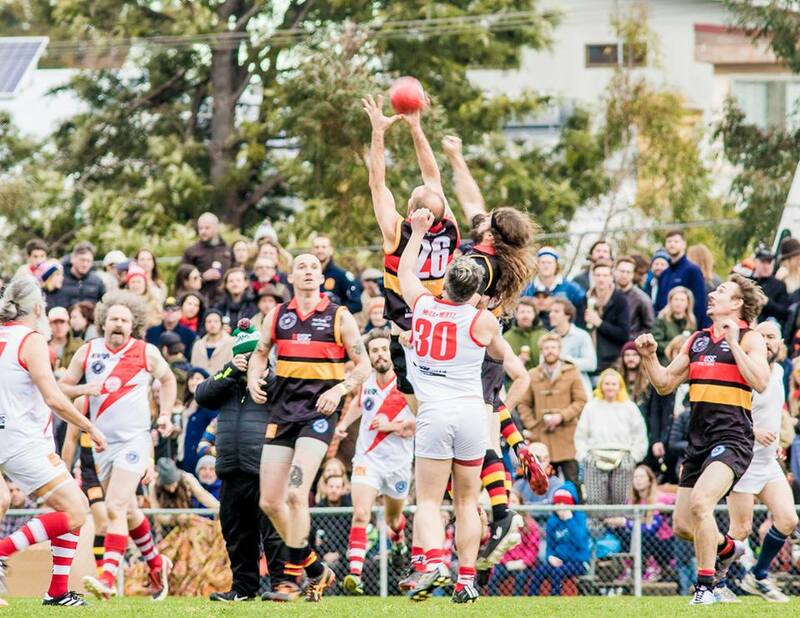 The Melbourne Community Cup 2018 is on Sunday June 24 at Victoria Park. Details and tickets HERE. Thanks for Publishing my photos, I truly appreciate it. Great write-up and photos too! Can’t wait for 3rd September at Fremantle Oval. Newshounds for the win! Is that a Striped Sunlight Sherrin? Affectionate, observant and for a fine cause, JTH. Go the Megaz. Go the Rockdogs. Go Reclink. Reclink is an amazing body. our Community Health Centre has had along involvement with Reclink. We’ve had footy and cricket teams made up from people using our services. It would be great to see a history of Reclink. It’s an organisation premised on participation, allowing those who are often excluded from other forums to come along , participate, break down their isolation, work on their health, have fun, be part of the world. A history of Reclink: I’d like to see that !!! I hope training for the Community Cup is banned; as are coaches, nutritionists, runners, and talent scouts. Some wonderful lines in here. Sounds and looks like a ripper day. The RecLink Cup is on my bucket list. Maybe next year. I am extremely proud to have been a subscriber to 3PBS for many years. Great report. Great photos. Love the Go Betweens story at the end. Great stuff, I went to the wrong game on Sunday but felt the vibe when the train stopped at Vic Park on the way to the G! Think you’ll find Benny Walker is Andrew Walker ex Carlton stars brother so not surprising he has some talent. Now that’s a reason to go to the footy. Love my city. Evo is a force of nature. Faced him on a wet deck at Petersham Oval last year and he takes his park cricket seriously. Kinda sorta. Ps JTH we saw the Go-b’a doco at the SFF. If you haven’t seen it, u will love it. Clinton Walker got all 10 of the coaches votes. BOG By the length of the Cattle and Cane intro. 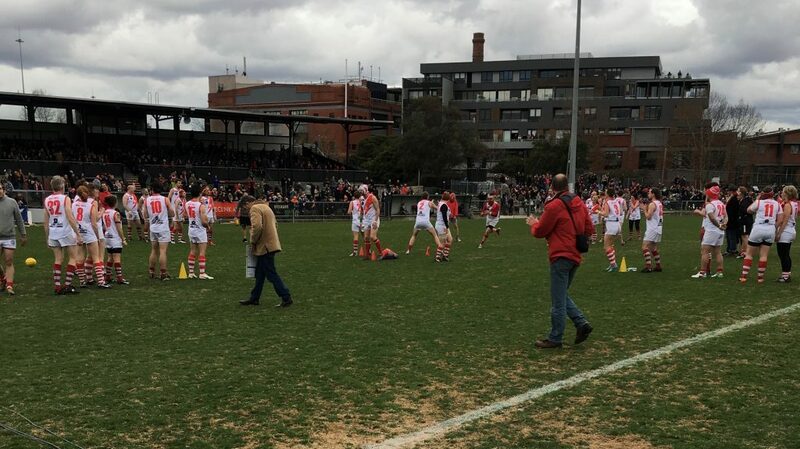 I remember playing in the Coulda Been Champions vs. Punter to Punter footy match at the old Fitzroy Brunswick st. oval. Was that a precursor to this game? Another excellent piece, John. Poignant and uplifting. Thank you. Sounds like a fun day JTH. A bloke I work with was a muso in a former life and once had some kick to kick with Tim Rogers, and reckons he’d looked pretty accomplished, so no real shame in him using you as a step-ladder! Fantastic JTH. I so need to get to one of these days. Wonderful to see a big crowd at Victoria Park. Ironically, at the very same time this was happening, I was in your town, at a gig at the Northcote Social Club. Fantastic, fun atmosphere at a fairly packed Vic. Park -a reminder of what footy used to be like. You can “feel”history/ghosts/passion/community at the old grounds. It was , truly, once a game of the people- Ludus Populi Populo, the VFL’s motto up until about 1970. That was when you could turn up, buy a ticket at the gate -no surcharge, booking fee etc; and watch a game for a very modest sum (With appalling amenities!) Now, some H & A games, GA can be $40 for basic tickets. 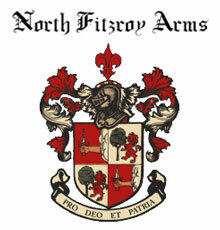 Next year will be great, when Coll.FC AFLW team will play there -as it always should have. 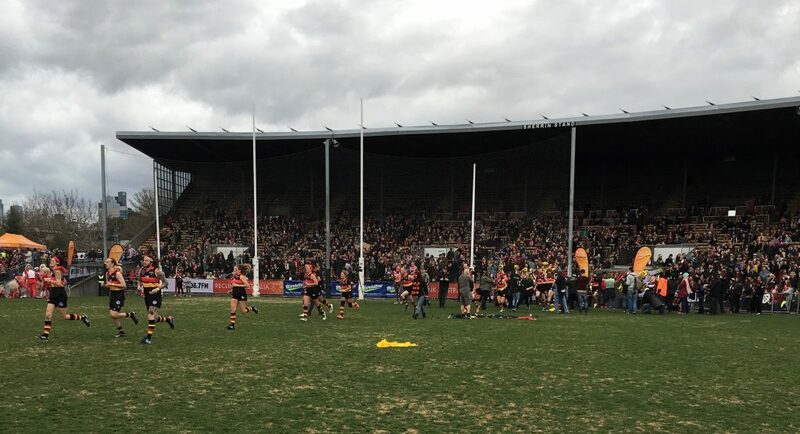 A big part of the appeal of the AFLW is playing at the tradition-soaked old grounds. I think Vic. Park will have some sell-outs next year, about 15,000+, with modern OHS standards (I will go early! ).